Oil States offers a full line of parts, accessories and rebuild kits to extend the life of our equipment. 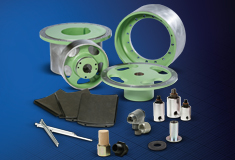 To complement the Oil States clutch and brake technology, we sell a broad selection of drums, drum hubs, spiders, quick release valves (QRVs), rotary couplings, rebuild kits and more. Please contact the factory for assistance with your specific need and application. Rebuild kits and rotary couplings.